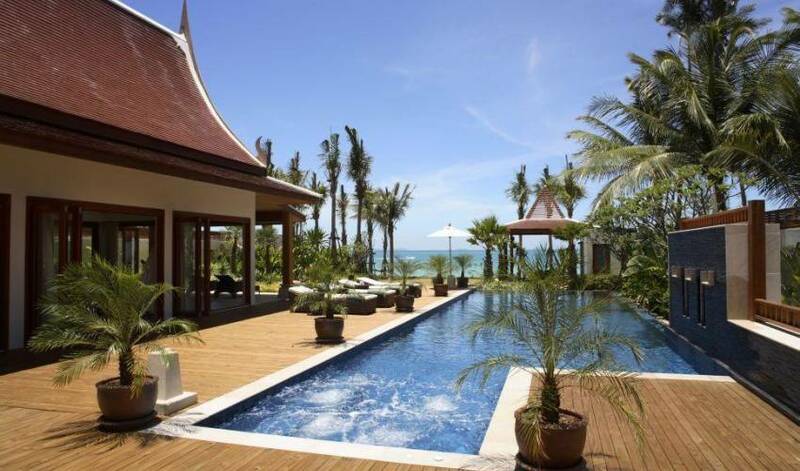 Villa 4383 occupies a prominent and stunning position at the head of this prestigious and luxurious beachfront development. 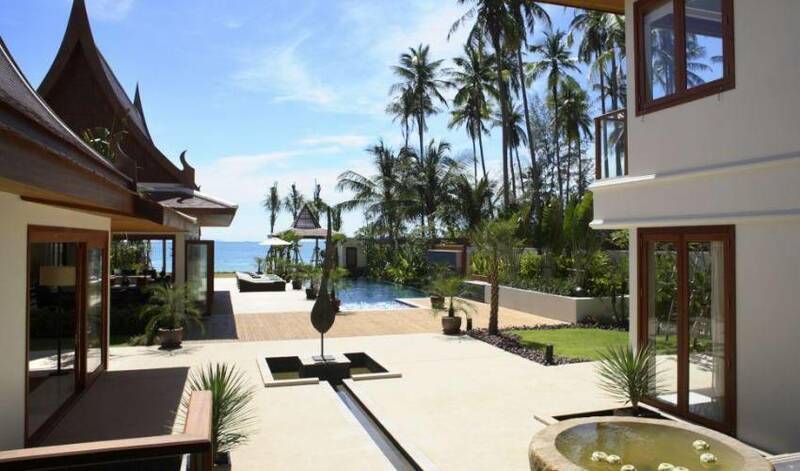 This villa epitomises the style, quality and flair that's expected at all of the estates properties and it fits most people's vision of a dream beachfront residence. Sat behind an imposing electronically operated gate, the driveway leads right into a tropically planted garden area with perfectly manicured lawns and stunning trees and water features. To the right is a two-storey pavilion that houses an upstairs suite comprising of a double bedroom with en-suite shower room and a large bathtub. A front balcony allows you to sit and look over the garden. Below are the maid's quarters. 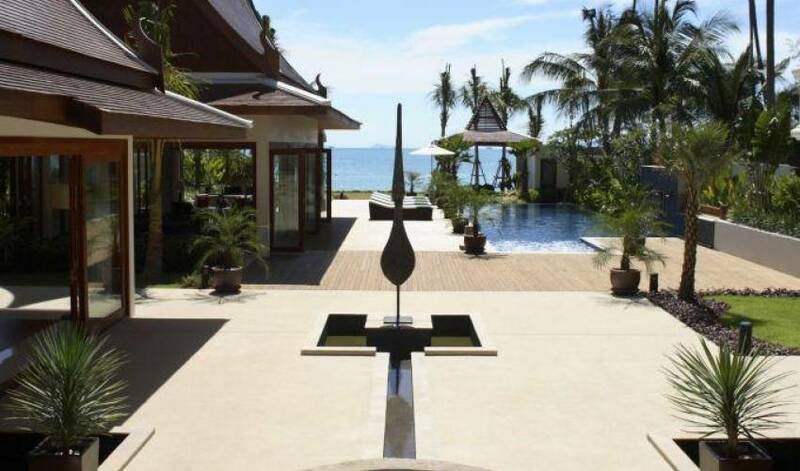 On the left of the driveway is a Thai Sala style entrance and pathway that leads across a water feature, through the garden and up some steps into the main building. Straight ahead is a large refined dining area which is open at the front and rear and has a beautiful wood-lined vaulted ceiling; adding to the spacious feel of this already large room. Views behind take in the garden and ahead is a clear view through the expansive grounds of the villa, across the pool, the garden and over to the beach and the sea. A teak dining table with cream cushioned chairs sits proudly at the centre of the room. 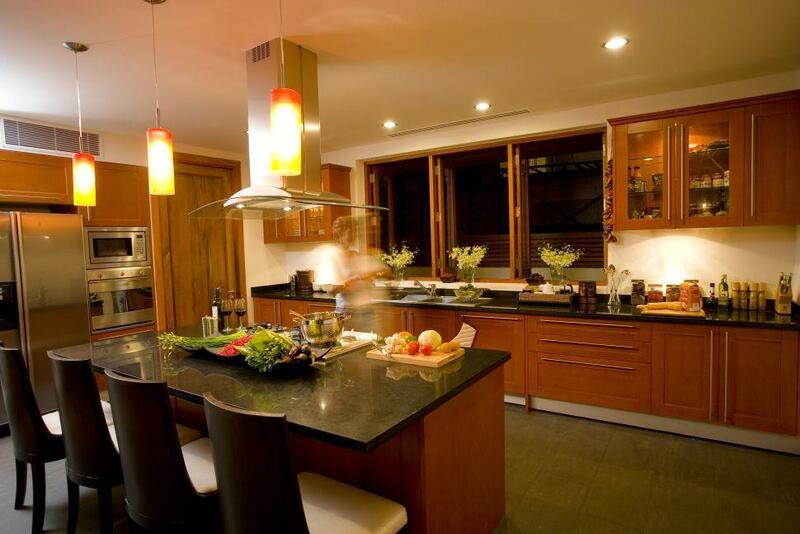 On the left of the dining area is an extremely well appointed kitchen with centre island feature, breakfast bar and a range of redwood units topped with black polished surfaces. The kitchen is fully fitted with top-end branded appliances and there's also a guest bathroom. 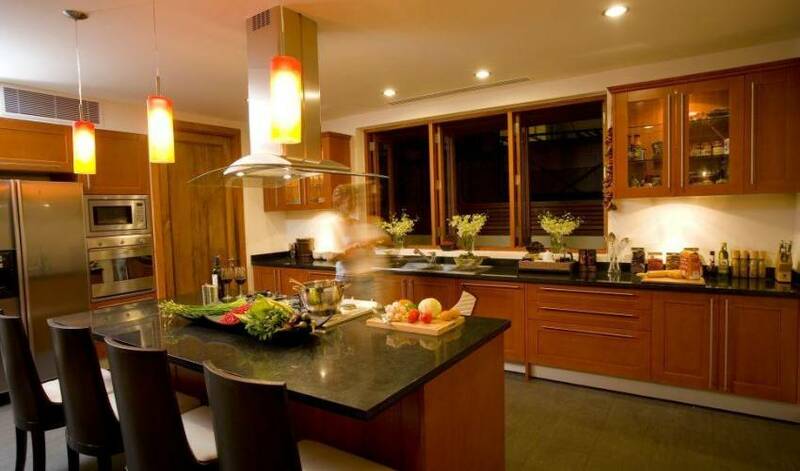 To the right of the dining table are a water feature and a hallway with a wooden staircase. To the right of the staircase is a large twin bedroom containing dark wooden beds accessorised with green and orange silks and artworks. Windows have views of the garden and the entrance to the property and a mix of contemporary furniture and a flat screen TV complete the room. The en-suite bathroom has a shower with a lilac tiled mosaic effect. On the left is a hallway with steps leading down into an elegantly furnished bedroom which has a separate dressing area and a large en-suite bathroom with twin sinks, shower and free-standing bathtub. Windows lead to an inner garden area adding a tropical feel to the bathroom. The bedroom has a front terrace, sea-views across the pool and garden and inside the furniture is modern and comfortable. Moving up the twisting wooden staircase you'll pass a stained glass window and come to two further bedrooms. At the top of the stairs, on the left side of the landing area is another en-suite double bedroom with a balcony and views across the entrance garden. In the bathroom the mosaic tiles are aquamarine in colour. On the right there's an exceptional bedroom with separate dressing area and a stylish bathroom with twin sinks, shower and a sunken bathtub. 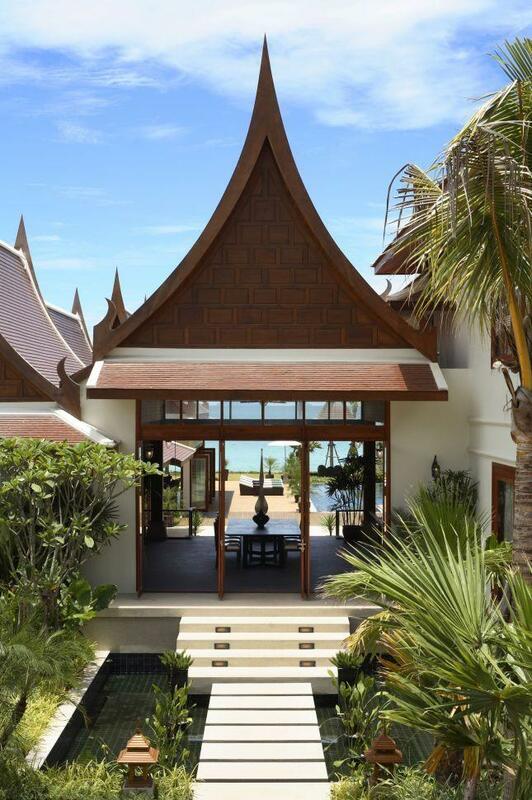 In this bedroom there's a high vaulted wooden ceiling and feature front window shaped to match the shape of the traditional Thai temple roof. The views from here are sensational and a front balcony allows you to sit and enjoy the view al-fresco. Inside, well chosen accessories and a flat screen TV provide comfort in style. Coming back downstairs and into the dining area, steps lead down passed an ornamental water feature which sits on a water channel that cuts through the stone terrace area and finishes with another ornamental central stone feature. 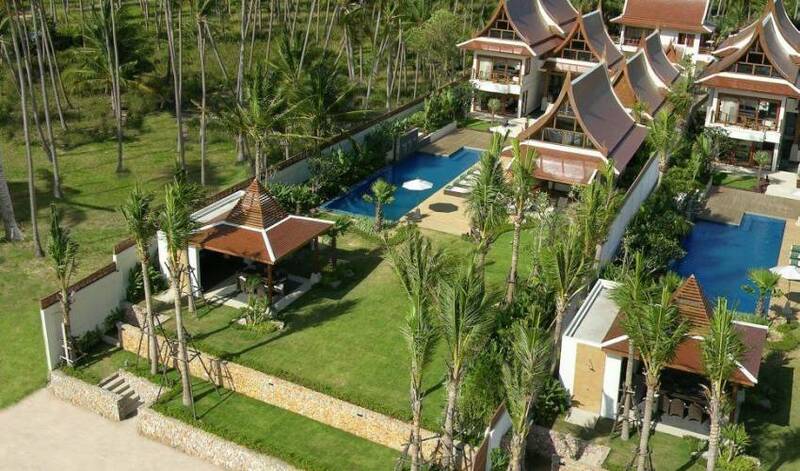 On the right is a lawn with tropically planted borders and to the left is a further delightful bedroom suite. In here there's a double bed, high quality furniture, a separate dressing area and large bathroom with inner garden, shower and a free standing bathtub edged with mosaic tiles. 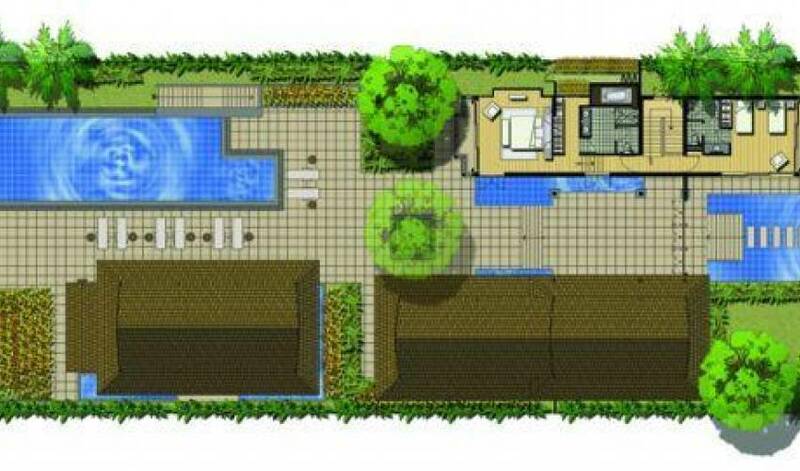 In front of this suite is a well planted garden area and a further water feature which wraps around the living pavilion. 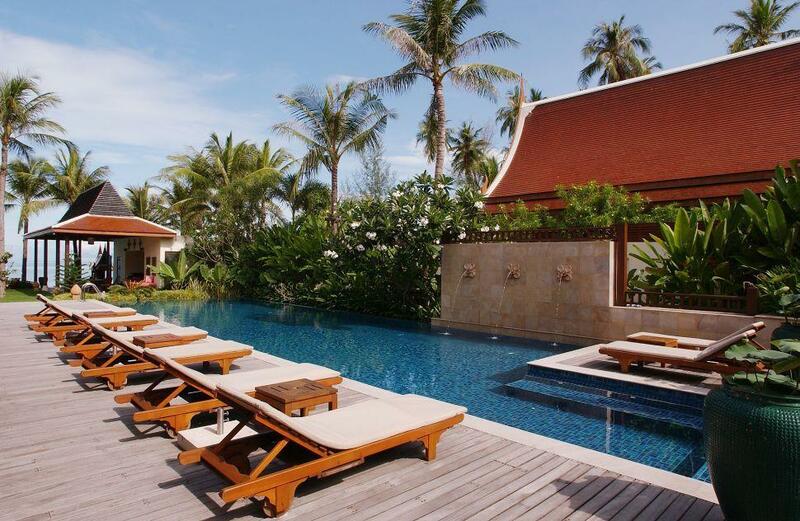 This is an impressive and flexible room with well chosen, fashionable, yet comfortable, furniture and opening doors on three sides which maximise the views of the pool, garden and beach. The furniture has an appropriate mix of modern and antique styles all complemented by the choice of artwork and accessories. For example; a large modern wall-mounted flat screen TV sits above a traditional styled cabinet and it looks just right. A highly polished wooden floor is bordered with natural stone tiles and the room benefits from a wooden vaulted ceiling that adds a final touch of class. 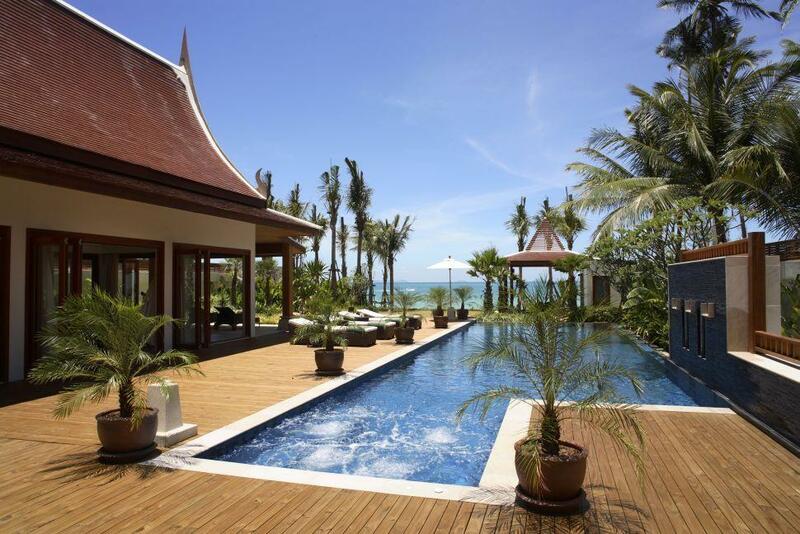 The inviting pool runs parallel to the living pavilion and it has a contemporary waterfall feature, Jacuzzi, and is surrounded by wooden decking and all-weather sun beds. 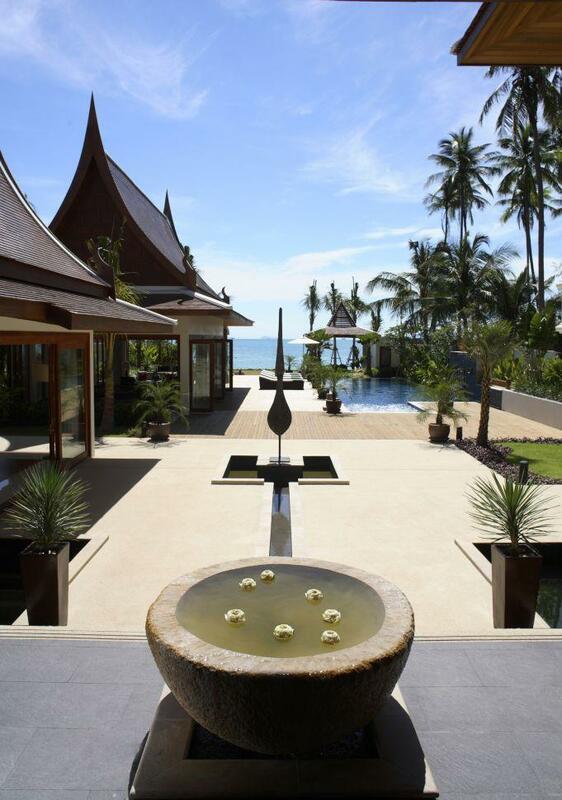 At the far end of the pool a stone pathway winds through the lawn and to the beachfront Sala. 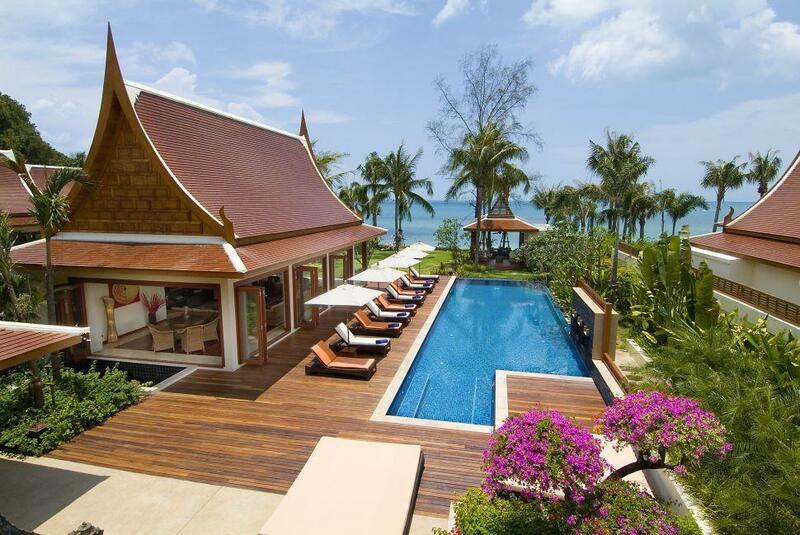 There's a covered outdoor dining area, more relaxing sun beds, a further kitchen and a bathroom situated here. 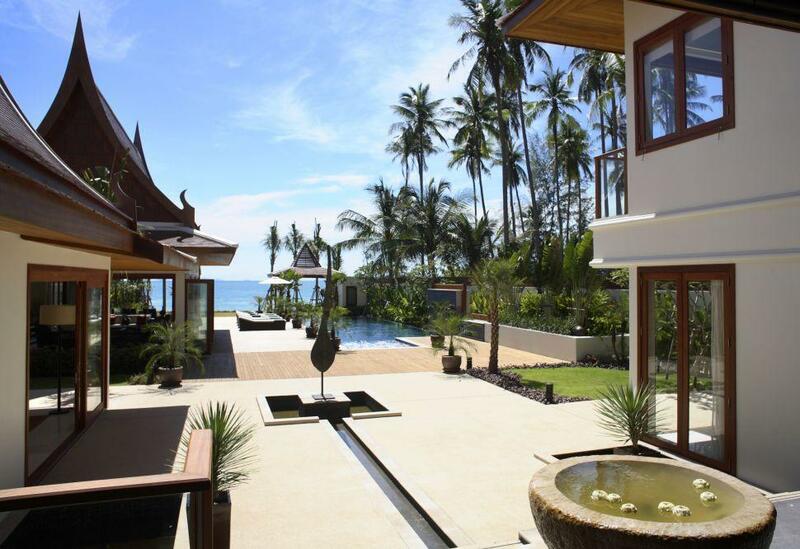 Steps lead down passed the outdoor shower to another narrow strip of garden and onto the white-sandy beach. 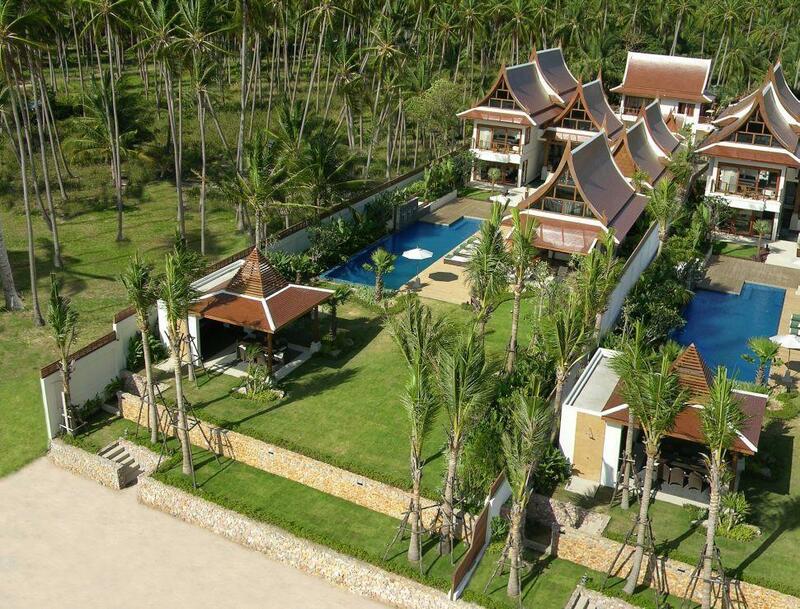 Throughout this extraordinary six bedroom villa the choice of artwork, furniture, accessories, appliances and the extensive use of natural materials results in a dream home that offers flexible, modern yet comfortable, accommodation. 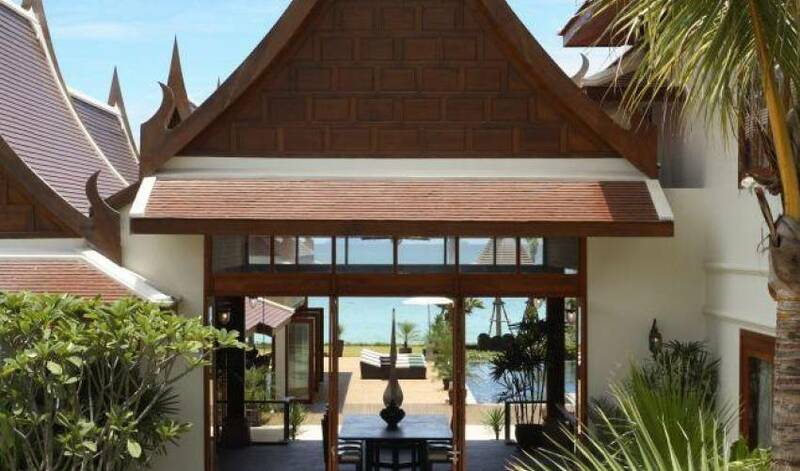 It is a villa that exudes style, class and is the ultimate in Samui beachfront luxury.